Last week I received a FreeStyle Libre Flash Glucose Monitoring System #FreeStyleLibre from Abbott to try out. I have been very interested in this product for quite a while as if it does what is claimed for it, it could be a huge help to people who are trying to learn how food affects their blood sugar. So today, having gotten through most of the Thanksgiving goodies, (which I did not want to track with a glucose monitor, thank you!) I got up my courage and inserted the sensor into the back of my arm. I had read all the instructions a few times and am hoping I did it correctly. The sensor comes with a spring loaded applicator that shoots it into your arm. It stung for about half a minute, as the sensor samples blood through a small needle. A bit of blood appeared on the outside of the sensor when I was done, which I wasn't sure about, so I called the 800 support number the company provides and spoke with a customer support person who assured me this was normal unless it hurt and/or there was "an excessive amount of blood." She was unable to define "excessive" but it seems like the thing isn't bleeding any more. I then waved a little phone-looking device over the sensor and it beeped and told me it was started and to come back in 12 hours. It takes 12 hours for the sensor to be able to report accurate readings. I will be very interested to see what the results look like. The booklet that comes with the Freestyle Libre System states that the accuracy is plus or minus 15-30%, which is broad enough to make you wonder. But this thing is measuring interstitial fluid, not the fingertip blood that can be a bit more accurate. I am mostly interested in the graphs it will produce to see where exactly peaks and valleys occur, and to learn what is happening late at night when I sleep, as I see higher fasting blood sugars than I like this past year, no matter what I eat. I don't know if it is dawn phenomenon or a raised fasting blood sugar. This should help, even if the actual readings don't match a good meter. The device which analzyes the sensor's data and graphs it also works as a blood sugar meter with FreeStyle Precision Neo test strips, which do not come with the system. So I will be checking against my trusty Ultra Mini and my old FreeStyle Lite meter which I still have some strips for. The FreeStyleLite meter usually reads about 10 mg/dl below the Mini. Here's a picture of the sensor, installed. I'll update my progress as it happens. There is an active discussion going on at my Facebook page. You can join in at https://www.facebook.com/bloodsugar101. Commenting is so flakey on the blog and the trolling it was receiving so ugly that I have had to turn it off. So here are my impressions after a full day of wearing the #FreeStyleLibreglucose monitoring system that Abbott Global Solutions gave me. I love it. It has its flaws, yes, but after almost 20 years of testing my blood sugar with strips, it is downright amazing to be able to check my blood sugar any time I want to and to finally be able to see what has been happening during all those many hours when I haven't been able to test. The accuracy I'm seeing is close enough that I can definitely see where it could be a huge help in getting better control for anyone who isn't getting very flat sugars eating an extremely low carb ketogenic diet--which is probably 99% of all people with diabetes in the world. I have 3 meters, none of which, it turns out, agree with the others, so this is just another meter that doesn't agree, but it is falling in the same general range as my other three. Sometimes it is higher, sometimes lower, but the magnitude is within 10 mg/dl and often closer. I'm not quibbling about whether a high of 164 mg/dl is really 155 mg/dl. It isn't 135, and that is what I'm concerned about. At this level of accuracy, I'm seeing very clearly how long my highs last and how they effect the low I see at the next meal. Some findings are a bit surprising. For example, the pizza slice I ate for lunch wasn't nearly as hard on my blood sugar as a slim slice of Thanksgiving pie I had for dinner later. The carbs were probably the same, but the high from the pie lingered forever. So what I learned is that as the day goes on, my tolerance for carbs seems to drop significantly. This is good to know, and since I usually eat my big meal at lunch, not a big problem. I'm eating a lot of stuff that will push my blood sugar up, while I have this device, in order to get a good idea of exactly how my blood sugar response is performing now. If I wore one of these for 10 days every month, once I had figured things out I would probably be more likely NOT to eat things that might make for a long, visible spike. I'm also seeing some things that I didn't know were going on at times when it wouldn't have occurred to me to test, including a several hours of what was for me a low blood sugar after eating a breakfast that met my target. 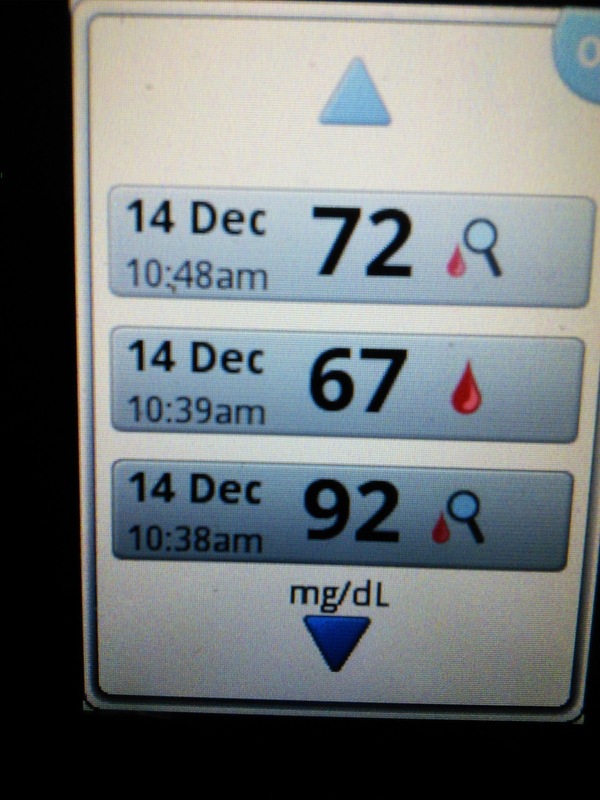 This wasn't a hypo, but it wasn't a number I had ever seen on a meter for a long time. With my limited access to strips I can't test very often, and mostly just look for highs. This explained the 85 mg/dl reading I got when the doctor sent me to the lab which I had found baffling as my fbgs are usually 108 mg/dl or higher. I'm also thinking that with this device showing me minute by minute readings I will, at long last, be able to get the repaglinide I take to work properly. I never felt safe using it with only the 50 strips a month I get from my insurance. Now I will be able to see exactly when it kicks in and how long it lasts. They tell you not to rely on it for dosing insulin, but so far it is pretty solid on when blood sugar is rising, falling or stabilizing. With repaglinide, which can cause severe hypos, any downward motion at a reading anywhere near 80 would be a warning that would get me testing with a meter. As far as comfort goes, I got used to it after the first night, and am now to where I don't even notice it. I was able to sleep rolling over on that arm with no issues last night. I even remembered to test when I woke up at 2 am so that I didn't lose any readings. The reader works great through my clothing and ski jacket. You can turn off all noises or set it to vibrate, so you can use it in public without anyone noticing it. Ditto late at night. It is also very easy to set alarms for 1 and 2 hours after eating and you can enter in the grams you ate when you enter a food. 1. The reader doesn't come with a case so for a woman like me who carries everything in a purse and wants to carry the reader everywhere, it's possible the reader could get scratched up. 2. The reader screen is not hard like cellphone screens but soft--which is understandable for the price. But you sometimes have to really press on it for it to know you have made a selection. 3. Though it keeps a log of your entries, only the last 3 show up on the screen at once and paging through is a pain since you may make dozens of readings a day. You can't see the details of how many grams were in a meal unless you find the original entry for the meal. With how often I am scanning the meter, this means I can't find what I ate without a lot of slogging. 4. The blood sugar graph is tiny and the scale goes up to 350, so for those of us in good control, it's hard to know exactly how large an excursion is unless we test during it. This is mainly a problem at night time. I saw several drops graphed during the night, but can't tell from the graph how steep they were. I.e. were they to 85, 90, or 100 mg/dl since I woke up again around 108. Supposedly you can upload your information to a web site so you can see your data better and share it with your doctor. I tried it and couldn't get it to work, but the company rep explained it won't be live until Friday. I will report on how useful it is when I can get it working. I am still waiting to hear what the price will be. Supposedly someone will get back to me. If they do, I will update the info in a comment on this thread. They did tell me that the Freestyle Libre system will be available for retail customers to purchase next Monday. However, you will need a prescription. If this is priced like the Canadian version, which would be $70/sensor, it would be well worth the money for anyone who isn't currently getting an A1c of 5.4% or better. Look at it this way. You are going to pay deductibles of $500 or more for a single MRI caused by the damage you end up with from high blood sugars. I'd rather spend the money learning what I need to know to avoid them. I am liking this thing so much, right now, that if the second sensor they sent me performs at the same degree of accuracy, I'm thinking that if I can get my doctor to give me the needed prescriptions, I will use one sensor each month to keep myself motivated and in range. My insurer won't be covering me for any device with that 5.7% A1c, and it will be a struggle to get the doctor to write the prescriptions, as he thinks it is hilarious that I am not happy with that 5.7% A1c. But seeing those 160s and 170s on the FreeStyle Libre (and strips) and the many night hours I am spending at 110-113 (no dawn phenomenon, it turns out) is motivating me to do better. 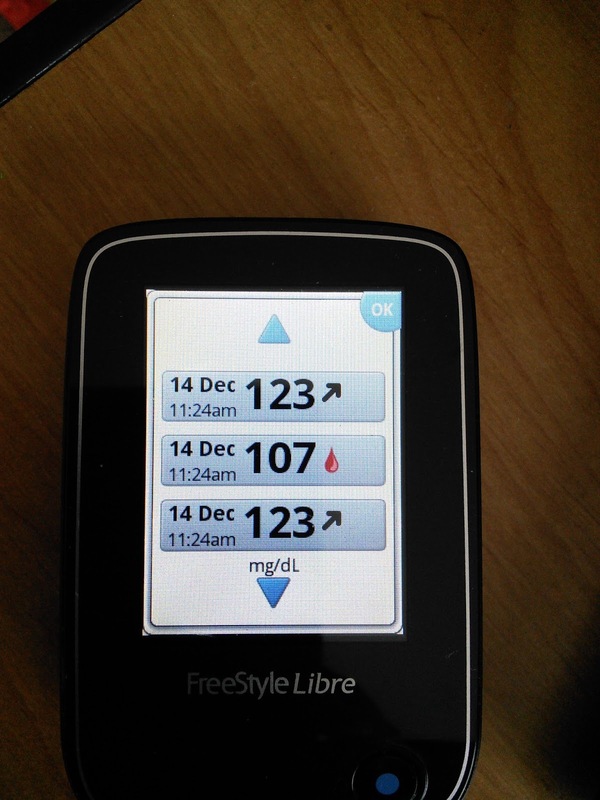 FWIW, the average blood sugar I am seeing on the FreeStyle Libre so far is 117 which matches my 5.7% A1c. I did see more discrepencies between the meter and the FreeStyle Libre system when I tested some repaglinide (which can cause lows) last night and ended up in the 70s. But I'm thinking it may also have been a bad strip or meter--because my two minis turned out not to agree. Basically, the whole meter thing is BS half the time, too. But still, all very useful, as I could see how long the effect of the repaglinide lasted, and when it kicked in, which were not when I expected, and explained why I was having so much trouble making it work. I have been moved to a generic instead of the brand name I used to use, and it definitely is NOT the same in terms of how long it takes to become active. I also, for the very first time, caught a low turning into a rebound high at night. I woke up saw a 72 on my FreeStyle Libre system and then about 25 minutes later, I surfaced from sleep and saw 118 mg/dl. I KNEW this was something that happens to me sometimes but never could document it it, and of course doctors told me it couldn't possibly happen. I also knew that when it happens I get a surge of high blood pressure, and a pounding pulse at times, too. The cardiologist insisted this, too, was impossible. So there doctors who told me I was FOS! Many of you have asked me what the price is going to be of the #FreeStyleLibre system. This just came to my email box directly from @abbbottglobal: "The list price for the FreeStyle Libre system is $36 per sensor and $70 for the reader (one time purchase). However, prices may vary depending on the retailer or an individual’s insurance carrier. We are still in negotiations with commercial payers." Close concerns has reported "Walgreens has the 10-day sensor priced at $43, compared to $53 at CVS; readers are $97 and $85, respectively." My guess is that Walmart will be cheaper, as is usually the case. Walmart, RiteAid and Kroger are also listed as participating pharmacies on the FreeStyle Libre official website. This makes this device highly affordable. And just in time for Christmas. Instead of having your relatives give you all those stupid "gifts under $10" which you will stick in a closet and eventually regift, you could ask them to pool together and get you a reader and a couple sensors. Some of you may wonder why I am suddenly so enthusiastic about a product from Big Pharma, knowing as you do that I am usually so UNenthusiastic about anything Big Pharma that I have been excluded from every single Big Pharma-sponsored diabetes blogger get together ever held. Well, the answer is what I care about is people understanding their blood sugar and learning how to lower it without all those toxic, ineffective drugs doctors prescribe because they are the easiest way to get diabetics out of the office. This device is mind-bogglingly informative. The only thing missing, sadly, is some hint in the company's manual, that if you see a high you can lower it by cutting back on your carbs. But we can get that message out a lot easier if people are seeing those real time spikes after eating. So Big Pharma this time has hit a home run and I honor them for it. For the price of a fancy cup of coffee you can get 24 hour real time monitoring of your blood sugar that is good enough to help you make the changes that will drop your blood sugar into the range that will keep you from every developing complications. You just have to be willing to cut the carbs when you see those long, ugly spikes. And at this price, it is very possible insurers will cover it, though my guess is, only for people on insulin. The only downside I can see, is that knowing how insurers think, it is possible they will try to force people on insulin to use these instead of the much more expensive Dexcom CGMS which is more accurate and reports continually without scanning and which issues alarms when a low occurs which can keep sleeping people alive. This is NOT a replacement for a Dexcom. It is an upgrade from 25 to 100 strips a month. It's like getting 1000 strips every ten days. And no finger pricks! BTW, the thing is still completely painless even though I keep rolling over and sleeping on it. You can read a discussion here on my Facebook Page where I show how tesing at 1 and 2 hours misses very different patterns of response to foods. The graphs are posted, too. So yesterday I started using the 2nd sensor that came with the #Freestylelibre I was given by Abbott. This one went in painlessly and did not bleed. Unfortunately, it is also MUCH less accurate than the first sensor that did bleed a bit. This is exactly what some of the European users of this CGM posted had happened to them, writing in the comments on my earlier post. The thing is still useful. I had headed out shopping yesterday after taking the dose of repaglinide that had been working for me quite well for the previous weeks. 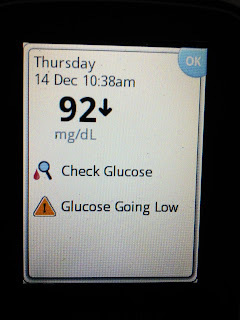 When I got to the shopping center, half an hour away, and checked my blood sugar with the FreeStyle Libre system it showed 92 mg/dl with an arrow pointing straight down. I checked with a strip (the FreeStyle Libre also works as a meter that uses Neo strips.) and saw 67 mg/dl. I immediately stopped and bought some Werner's hard candies which are mostly glucose, as I couldn't find the glucose I thought I had with me. I quickly chomped up the hard candies, for 12 g of carbs, and that started the monitor readings trending upwards. When I checked again with the meter about an hour later, the FreeStyle Libre system said 123 mg/dl trending up while the meter said 107 mg/dl. This was high enough for me to drive safely. I'm not sure if the issue here is that this sensor is measuring interstitial fluid while the earlier sensor--the one that bled at insertion--was getting some capillarly blood, but that is my guess as to what happened. This tempers my enthusiasm for the FreeStyle LIbre a bit, but I can still see where it could be far more useful than just strips. In addition, I filled my prescription for more sensors at Walmart. Each sensor was $40.43. Comparing that to the price of strips, it is still a decent deal. If insurance will cover it, it's obviously a good choice. The Neo strips are $19.95 on Amazon for 50. I like using them, though my insurance doesn't cover them, because then I get the value logged with the CGM readings on the FreeStyle Libre. In the shots below the red droplet is a reading done with a Neo strip and the other readings are from the sensor. The magnifying glass with the droplet is a signal that the blood sugar was moving swiftly enough that the system was urging me to test with a strip before making any treatment decisions. Here is the detailed screen that came up with that 92. Here you see the meter showing a higher value, but this time rising. The test strip showed a much lower reading, but still in a safe range. 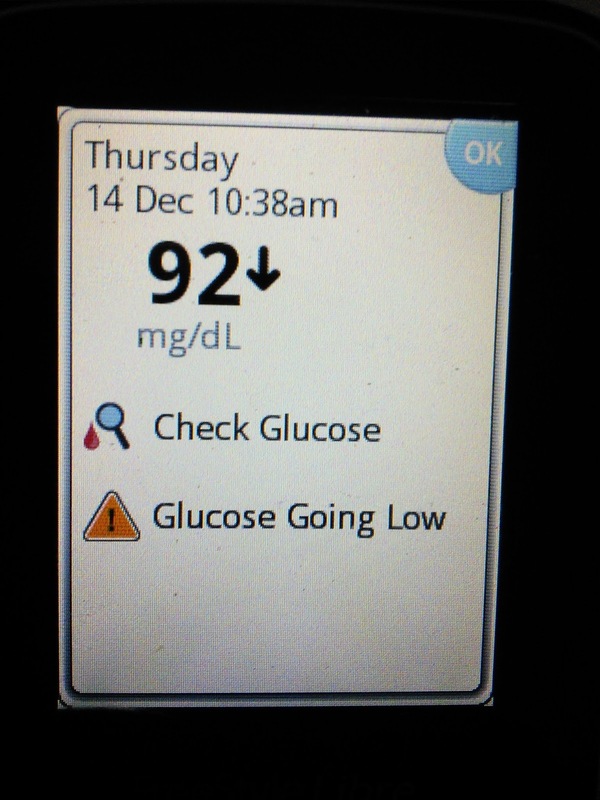 After fininishing up the use of my second #FreeStyleLibre sensor. I've learned a couple more things. One is that the blood sugar lows I was seeing at night are not real. It turns out that if I sleep on the arm that has the sensor, the sensor reading drops.I was able to produce this drop at will, just by lying on my arm for 15 minutes. I assume that this is caused by a restriction of the blood flow. I had noticed before that a hot shower raised the reading temporarily too. This sensor was nowhere near as close to the meter readings as was the first one I used. This somewhat lowered my enthusiasm for it, but I continue to believe that the device would still be extremely useful to someone who isn't aware of how the meals they eat impact their blood sugar. Tthe size of the discrepency between my meter and the FreeStyle Libre system, which was 30 mg/dl at the very worst and mostly much less than that would be of little importance to someone who was routinely going up over 250 mg/dl after every meal. By altering what they ate, which, for most people, means cutting carbs, they would still see a drop of 100-150 mg/dl or more, after making the dietary change. This would easily be enough to motivate them to keep working on modifying their diets. They should also see a drop in their fasitng blood sugar after a week of lowering their post meal numbers. I was able to use this sensor to figure out how to get my crummy generic repaglinide to work better. I also, saw how great an impact the hormone replacement I use has on my blood sugar because I don't take it for a week, and that week was covered by this sensor. 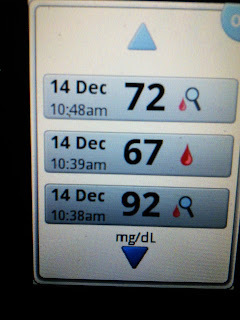 As soon as I started taking the hormone again my blood sugar went up across the board. I had suspected this was the case, but now was able to document it. I am hoping to get my doctor to prescribe the brand name version of repaglinide to see if it does work much faster, as I recall it doing when I used it a few years ago, and will use my next sensor when I have that prescription. For now I have determined exactly when the best times for testing are, and when to take my repaglinide. I have learned that my fasting blood sugars are very unpredictable, even allowing for the false readings on the sensor caused by sleeping on my arm. They are reasonable sometimes and higher than I like at other. I will spend more time analyzing the data I collected with this sensor, comparing the patterns to the specific meals I ate, which I logged, to see if the higher fasting blood sugars are the result of eating a lot of protein at dinner. I definitely see a much better blood sugar profile eating my big meal at lunch, but it is very hard to do this consistently without negatively impacting my family who often need to eat dinner. I think the average person with diabetes who is NOT using insulin at meals could probably get all the benefit of this FreeStyle LIbre Continuous Glucose monitor using no more than two or three sensors. That makes the investment manageable--$40/sensor and $70 for the reader--which is considerably less than the copay for an MRI. For me the cost works out to the cost of two and a half doctor's appointments with a specialist. with labs. As reported in comments posted to one of my posts about on the Facebook Blood Sugar 101 Page, another FreeStyle Libre early adopter, Cheryl Burns Perkins had an unreliable sensor that measured wildly inaccurate readings and fell off after a short shower seven days after she applied it. (The sensor is supposed to last 10.) She reported that customer service agreed that was unacceptable and is sending her a new sensor and some of the Neo strips that work with the reader.